Have a peek at the amazing Gibb River Road while visiting Mt Hart Wilderness Lodge nestled in the King Leopold Range. 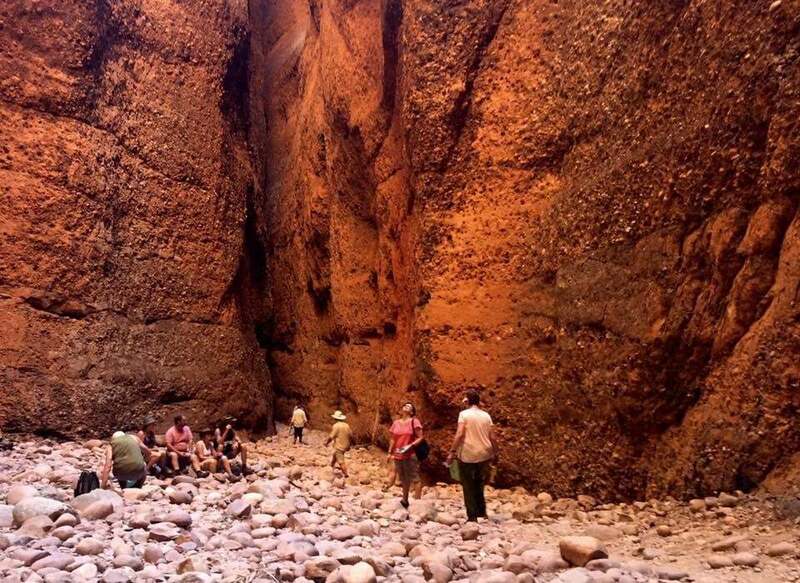 Explore Tunnel Creel, Windjana Gorge, Bell Gorge and the Outback on this short but feature packed tour. 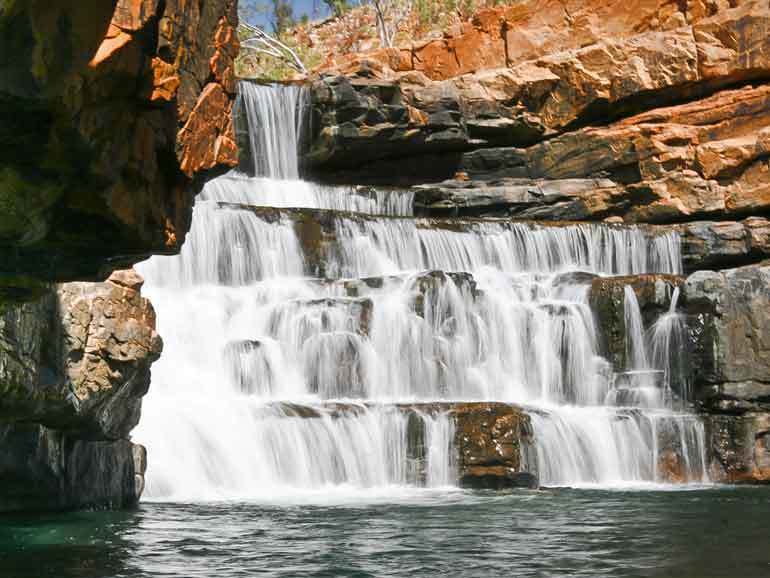 Relax a savour the vast beauty of the Kimberley on this short but amazing tour. 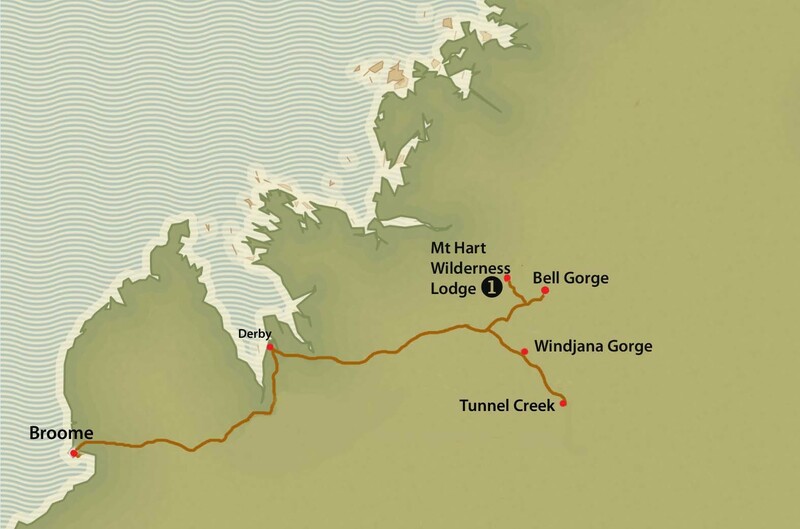 Visit Tunnel Creek, Windjana Gorge, Bell Gorge and the tranquil Mt Hart Wilderness Lodge. After pick up commencing from 6 AM at Cable Beach Club, The Oaks Hotel or Broome Visitor Centre, we head off to Derby crossing the mighty Fitzroy River at Willare Bridge to collect more passengers from Derby. We will have morning tea outside the Visitor Centre, before heading east on the Gibb River Road. From here we commence our journey along the iconic Gibb River Road on a scenic drive through ancient outback landscapes of the Kimberley. 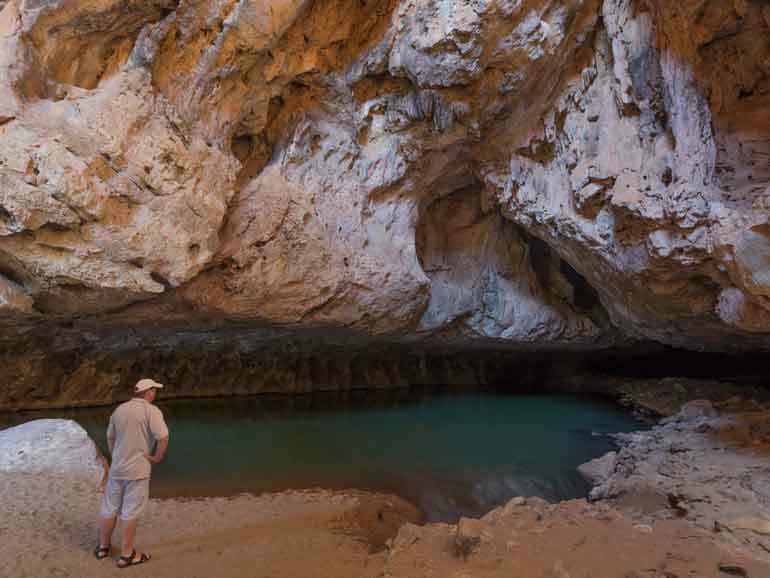 Our first stop is a visit Tunnel Creek and Windjana Gorge. Tunnel Creek, Western Australia’s oldest cave system was the hiding spot for the aboriginal outlaw “Jandamarra”, and we will take a unique torch light walking tour (wading in some places) along the underground river bed as it flows beneath the range. 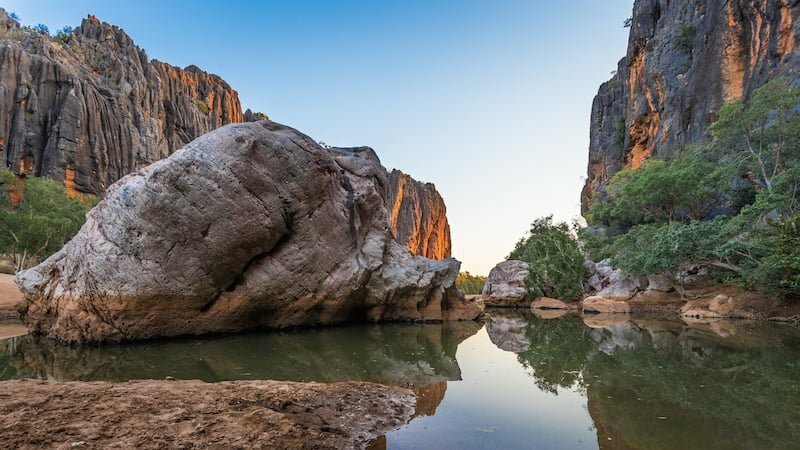 The Lennard River also carves its way through the range at Windjana Gorge and is part of this same ancient Devonian great barrier reef system, that was far larger than the famous Great Barrier Reef, but now exposed on the surface. It was laid down in an ancient sea that covered a large part of the Kimberley in Devonian times, some 350 million years ago. 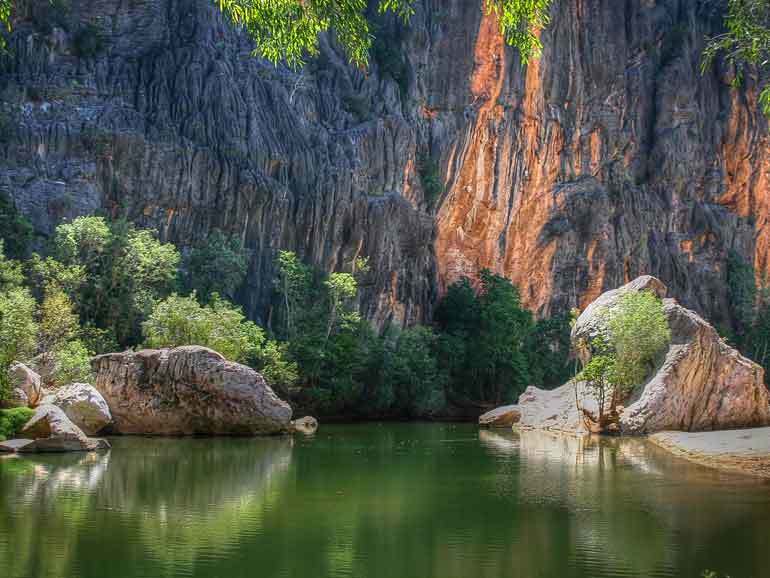 The colourful and rugged Windjana Gorge with its vertical limestone cliffs, fossil fish and deep green pools inhabited by dozens of freshwater crocodiles is sure to impress with its distinctive primeval feel and you are sure to capture some amazing photographs. After a picnic lunch we to return to the Gibb River Road, heading deep into the heart of the Kimberley. We view a startling rock formation resembling a profile view of Queen Victoria’s head as we pass through a gap in the jagged and stunning 350 million year old Devonian limestone cliffs of the Napier Range. Shortly after we enter the ancient rugged King Leopold Ranges with its many creeks and gorges on our way to Mount Hart Wilderness Lodge. The Lodge is nestled in a tropical oasis on the banks of the Barker River and the area abounds with abundant bird and wildlife populations. 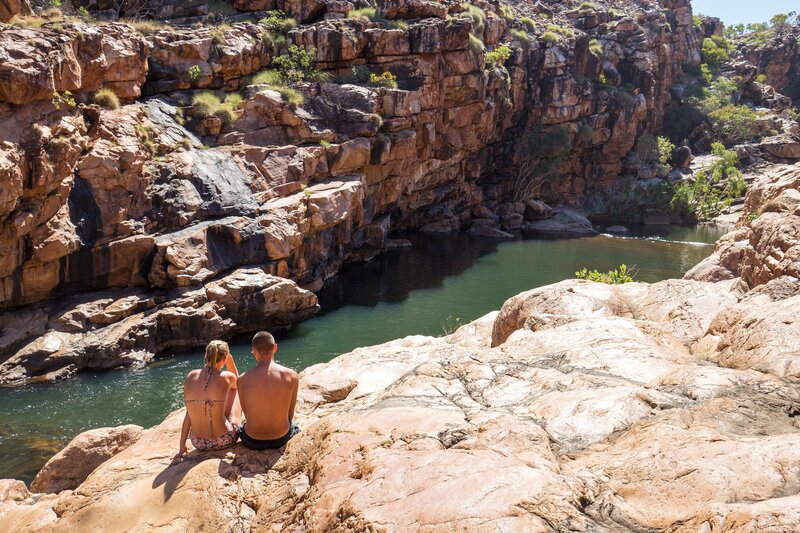 Located in the heart of the King Leopold Ranges Conservation Park, Mt Hart’s proximity to many of the Kimberley’s major attractions make it an ideal base to explore the region over the next two days. 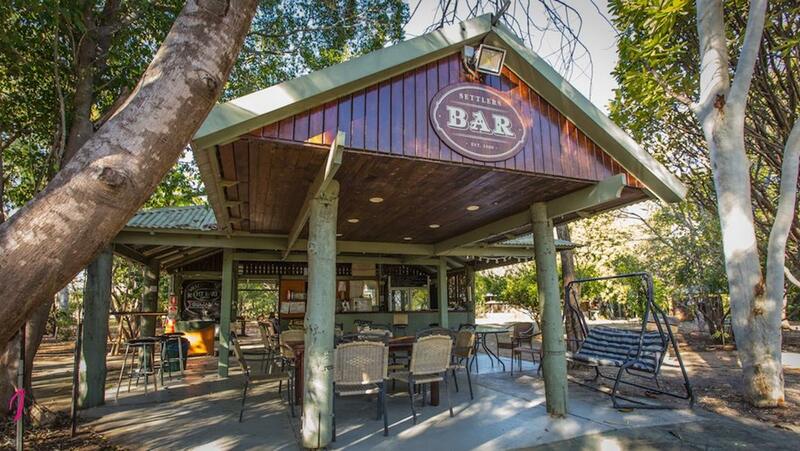 Originally a working cattle station, this unique property offers a rich pastoral history, that offers a rustic ambiance and exceptional hospitality. Enjoy a spectacular sunset before heading to the bar for a refreshing drink (own expense). After a delicious 3 course meal prepared by a top chef, you will settle in for the evening in a comfortable safari tent/homestead room under a star filled Kimberley sky. After a glorious sunrise at Mt hart we head to Bell Gorge, one of the most iconic gorges and waterfalls of the Gibb River Road. Making our way further into the King Leopold Ranges that rise to some 950 metres above sea level. After passing the old Silent Grove homestead we will enjoy a day of swimming and exploring one of the most impressive waterfalls and gorges of the Gibb River Road. At its entrance, Bell Gorge has a stunning permanent waterfall. Torrents of water flowing north west over the millennia from the King Leopold Ranges have cut down through the ancient sandstone rocks to form a spectacular gorge. At 300 metres above sea level it is the beginning of a series of waterfalls and rapids some 80 kilometres long descending through the King Leopold and Isdell Ranges to Walcott Inlet before entering the Timor sea at Yule Entrance. Bell Gorge is a great spot for swimming, photography and for enjoying the best of what nature has to offer. After a relatively moderate one kilometre down hill walk, you will be rewarded with the irresistible opportunity to take your first swim in a magical Kimberley waterhole at the top of the falls. The more adventurous may choose to venture further and climb down to the bottom of the waterfall and enjoy a thunderous refreshing shower in the crystal clear waters of the plunge pool. You may even spot a “Mertens Water Monitor” sunning itself on the rock ledges, or rock wallabies resting in the shade of the overhanging ledges. A picnic lunch will be enjoyed adjacent to the waterfall. Then it will be time to head back to Derby and drop Derby guests before the drive back to Broome for our final farewells. What to Bring It is recommended that you bring a torch, wet shoes (old trainers for walking in shallow water, sandals, a broad-brimmed hat, sunscreen, swimming costume and towel, good walking/trekking shoes and a personal water bottle. It is also recommended that you bring insect repellent, warm clothes for the evening (particularly if travelling in Winter), personal toiletries and first aid, with any personal medication required. Itineraries may vary and/or attractions can be substituted for any cause including seasonal conditions, weather extremes, traditional owner and national park requirements. This tour does require some level of fitness, most hikes are over uneven terrain, often in high temperatures. Temperatures can be extreme i.e. very high during summer days and very cold during winter nights. The operator reserves the right to assess the fitness capability of passengers prior to tour departure. Due to distances covered, this trip involves early departures on some morning and frequent stops between destinations. This tour is not suitable for children younger then 7 years old. Travel Insurance is strongly recommended. Failure to purchase travel insurance may result in out of pocket expenses in the case of accident, illness or road closures. We recommend Travel Insurance that includes coverage for Medical Evacuation. It is your responsibility to advise us if you have any special dietary requirements or medical conditions (including allergies) well ahead of departure. It is your responsibility to contact us with your preferred accommodation pick up point. If we do not hear from you, we will assume you will make your way to our default pick up point as listed on this document. We will not be responsible for missed pick-ups (and a missed tour) if we do not receive notification from you, and if you are not at the default pick up point at the appropriate time. Terms & Conditions These are the Terms and Conditions under which Kimberley Outback Tours noted below. Payment of the Tour deposit represents an acceptance of the Terms and Conditions. Please take the time to read and understand the conditions of booking set out below. BOOKINGS, DEPOSITS & FINAL PAYMENTS You are required to pay a non-refundable deposit of 20% per person per trip for your booking to be confirmed. The deposit will be required within 7 days of booking. The balance of payment is due 30 days prior to departure date. Prices are quoted in Australian Dollars inclusive of GST for Australia and are valid for travel until 30 September 2018. CREDIT CARD FEES If paying by credit card a small transaction fee of 1.1% is applicable. Cards accepted are Visa and MasterCard. 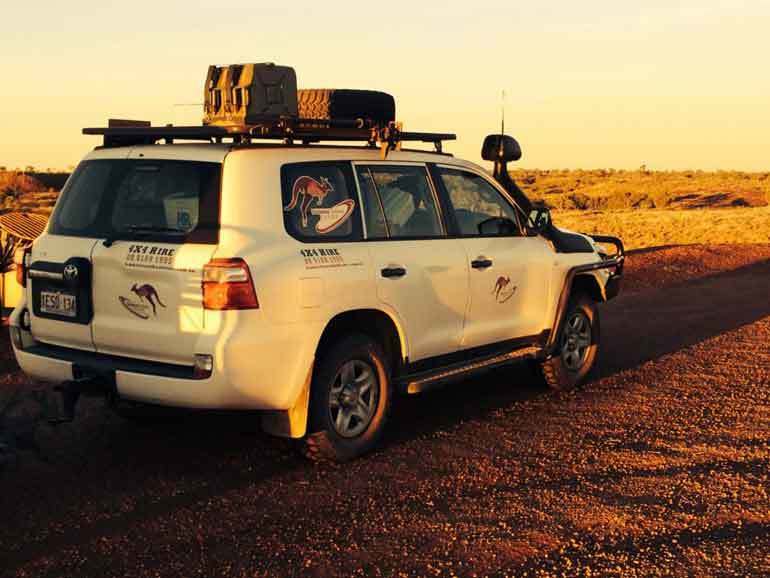 CANCELLATIONS For cancellations made within 29 days of your scheduled departure, you will be held financially responsible for your entire reservation, unless Kimberley Outback Tours Pty Ltd can fill the vacancy. Changes of reservation date or early departure are treated as cancellations and will carry the same fee. 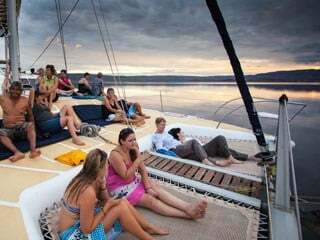 You For cancellations made within 29 days of your scheduled departure, you will be held financially responsible for your entire reservation, unless Kimberley Outback Tours Pty Ltd can fill the vacancy. Changes of reservation date or early departure are treated as cancellations and will carry the same fee. You are, however, always welcome to send a friend or a family member in your place. Note: Management reserves the right to re-assign, cancel or change seats in unforeseen circumstances. 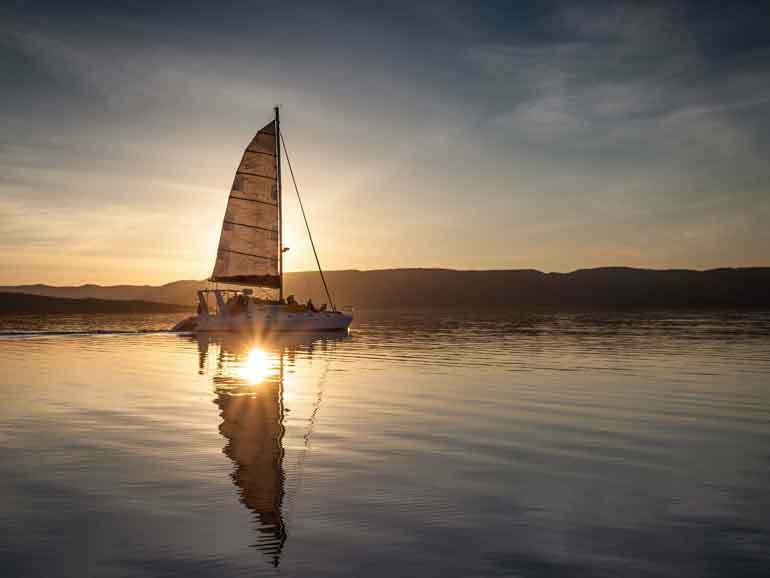 14 days or less prior to departure, we will retain 100% paid by you in connection with the booking. No smoking is allowed on board our tour vehicles. 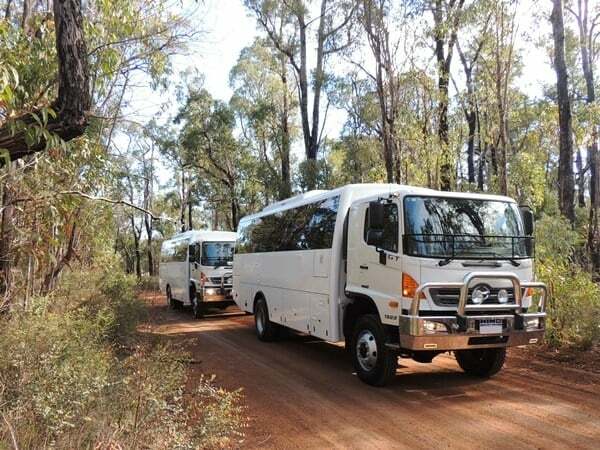 At the discretion of Kimberley Outback Tours, if any passengers conduct or condition is creating an unsafe environment for themselves, other passengers or tour operator, they will not be permitted access to the bus to continue the tour and no refund will be paid. Most tours require a certain level of participation. This may include assisting and cleaning with the preparation of meals and setting up camp.